We read aloud because we enjoy it. Our reading streak is just over 3 years old; my boys and I want to see just how long we can keep it alive. We also read aloud because it’s one way to keep the three of us close to each other and to give us a point of connection each day. Lots of other reasons why we read aloud, but with this book, we add a new one to the list: We read aloud for homework. My middle schooler’s summer reading assignment is “The Alchemist” by Paulo Coelho. The kid is a strong reader. He can power through big fat books in a day or two. His reading comprehension is good. His grasp of subtleties not bad. His ability is recall minute details is down right impressive. But he’s real picky about what he’s willing to read on his own time. For the past two years, his favorite genre has been the very popular “everything is bad” dystopian novels. 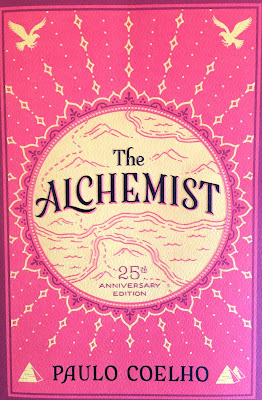 “The Alchemist” most definitely does not fit in his “like-to-read” category. Just watching his face as he read the blurb, I knew he was going to struggle with the assignment. A month into summer, I realized he was avoiding it altogether. I figured, if left alone, he’d make himself miserable and botch the assignment by rushing through it at the last minute. I decided to intervene by reading his assignment aloud. He could follow up by reading and annotating on his own after we first worked through the book together. I can’t quite decide how I feel about this book. I thought the term “personal legend” was corny. I don’t agree with the theme “when you want something, all the universe conspires in helping you achieve it.” But I do like the story of how the shepherd boy pursued his dream, even in the face of hardships and setbacks. I also liked the part where the crystal merchant tells why he chose not to pursue his personal legend. I thought the twist at the end of the book clever. Like it or not, I am glad we read this book aloud. Think my boy would have been frustrated had he tackled it solo from the get go. Instead, we took our time reading it aloud. Stopped to look at maps. Discussed how some of our discomfort with the style could be because the author comes from a different culture from us. We still can’t quite agree with what the real treasure was. But tell you what, my boy picked up the book today and started reading it for himself – with still a full month before the end of the summer. Mission accomplished for me. 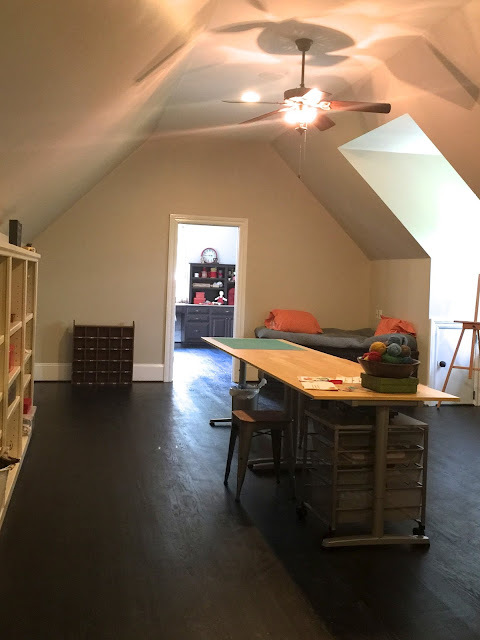 Does creating the Ultimate Craft Room count as crafting? I’ve been dreaming of “A Room of Her Own” forever. Store all the crafty crap I’ve accumulated over the years. I’ve carved out multiple versions of my dream space. 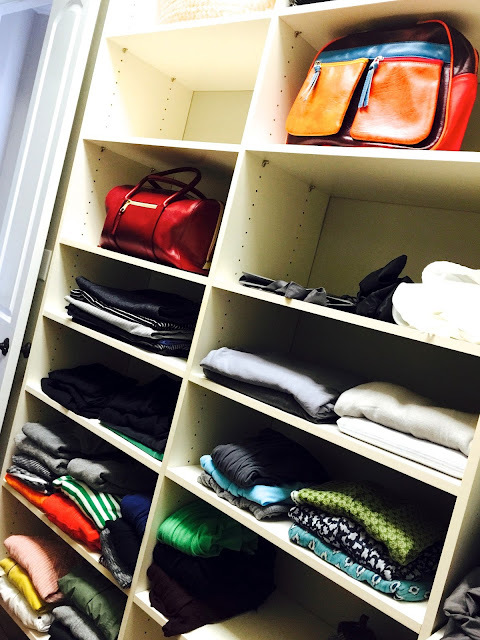 Was the envy of quite a few NYC friends when I allocated an entire closet in our apartment for crafting supplies. Met with a little misfortune which resulted in closing down said shop. Still plenty big enough for laughs and lessons with friends and students. 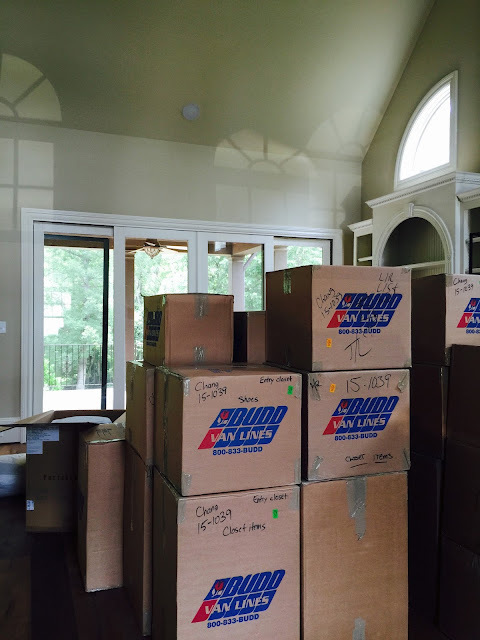 We packed it all up and moved to Charlotte, NC. For excitement, options and just plain everyday weirdness all around. But the new life is darn good too. The most obvious trade up is space. 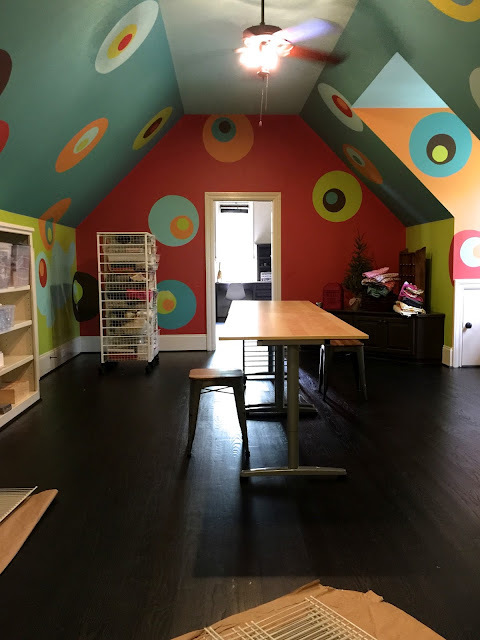 Which brings us back to The Ultimate Craft Room. An unheard of luxury in NYC. One ginormous room over a three car garage. (just begging to be turned into a sewing room). (I like it as a kid craft but not on my walls). Floor guys ripped all the smelly carpets out of house. They made for a big pile of steamy stink on my driveway. So grateful when they hauled it all away. 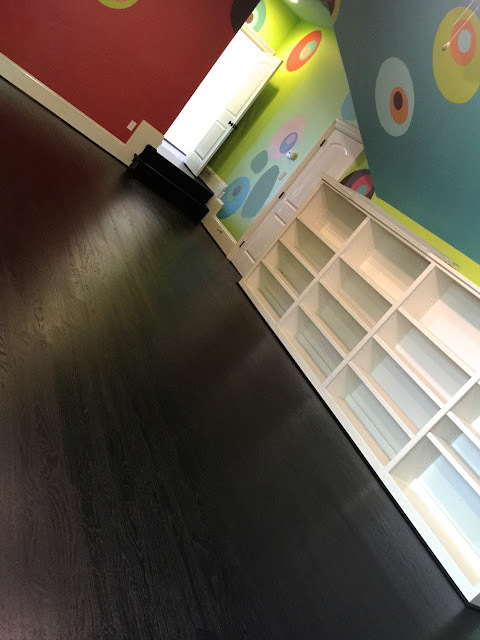 Love the sleek ebony finish on the new hardwood floor. I should have waited til after painting to unpack. But I figured painting around stuff was no worse than painting around piles of boxes. A huge thank you to Omar & his fabulous painting crew! 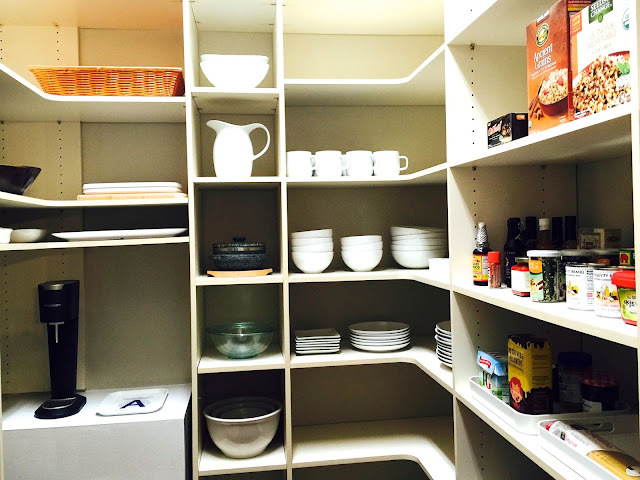 A plethora of built in shelves. Interesting little nooks and recesses. A neutral warm grey color. Where I can get making again. 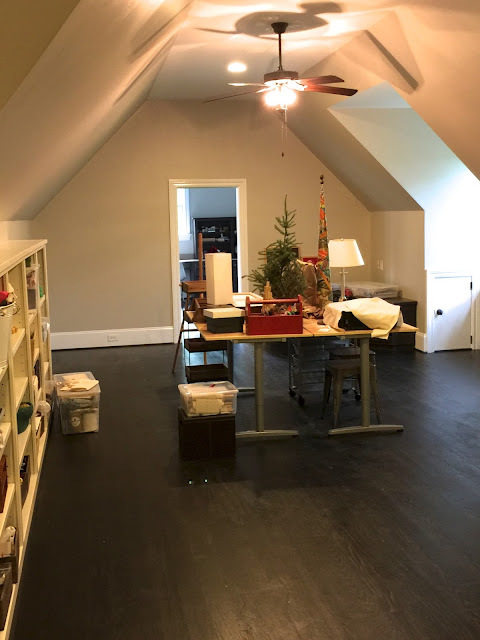 Love, love, LOVE my new space. Finally getting to the fun stuff in our big ol’ house. 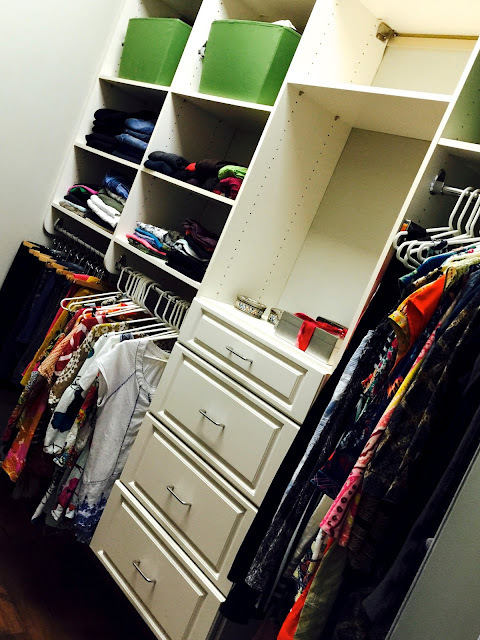 Figuring out how to fit the rest into a few small closets. But it’s a whole new game now that we’re in Charlotte. And boy-oh-boy am I enjoying this part of it. I’m now amusing myself by naming each of them as I unpack. Set my clothes in order. Placed a colorful upholstered stool in the corner. Set up a vignette of favorite little treasures and mementos. Tucked my lavender sachets into the drawers. A calm and quiet corner. The first room in the house to smell right to me. this was where I retreated to when I needed a moment. Here’s where my OCD comes in handy. 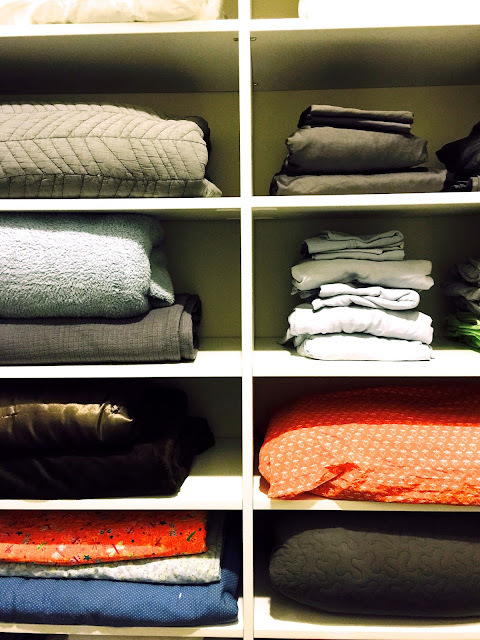 Compulsively sort, group and line things up all the time. A clean, organized space that makes me smile each time I walk in. Framed artwork and photos closet. House slippers and guest coat closet. Pool toys and gardening supplies closet. into a writing nook for him. In NYC, this would have been premium real estate and staged as an entire bedroom. 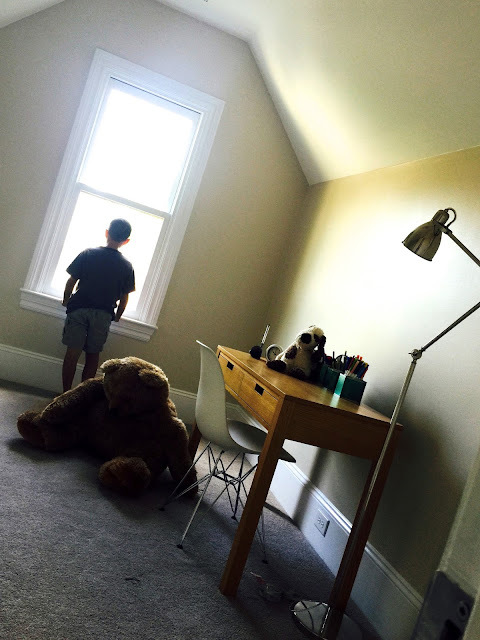 Much of our house is still sitting empty. Our Manhattan household was swallowed up in one gulp by the new house. Dishwasher still reeks (can’t wait to get it replaced). Remember those “What’s grosser than gross” jokes? I loved them as a kid. Couldn’t get enough of them. Told the same ones over and over again. Cracked up uproariously every single time too. And I’m not finding it particularly entertaining. Grit and hairs left scattered in kitchen and bathroom drawers. At least a month’s worth of 2 big dogs’ poo all over the back yard. To discover a wet stink and foul brown gunk. I scooped out the sludge. Poured bleach into the dishwasher. Ran it with extra heat. Still couldn’t get the stink out. Added “dishwasher” to the “replace” list. We discovered the source of the increasing stench in the house. I’d turned the AC down a bit. Dog urine stains in ALL the carpets to resurface. 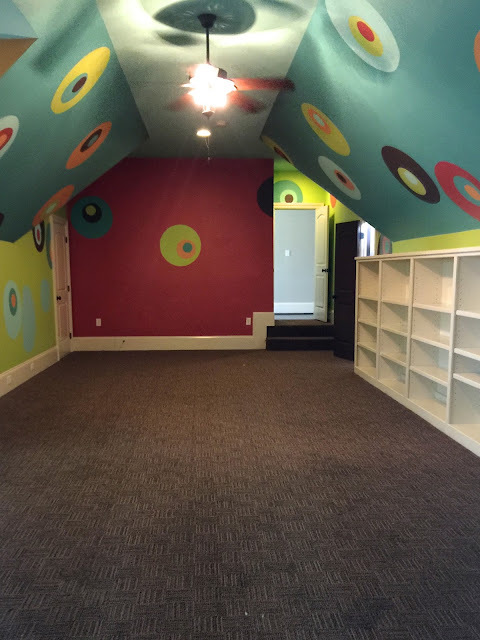 Replacing all carpeting became a necessity. Filled the tub with hot water. What came out was a mass of floaty black jelly stuff. Imagine a whole bathtub worth of miso soup with extra seaweed. That’s how I found the hot water heater had failed. Don’t want to judge others. Trying hard to just move forward. I still believe in this house’s potential. Checking off the long “to do” list one item at a time. Reassuring myself that these “Grosser than gross” moments will surely come to an end. Then the appointment with the refrigerator repair man on Friday. he taught me to unscrew and unplug the fancy bottom produce drawers. 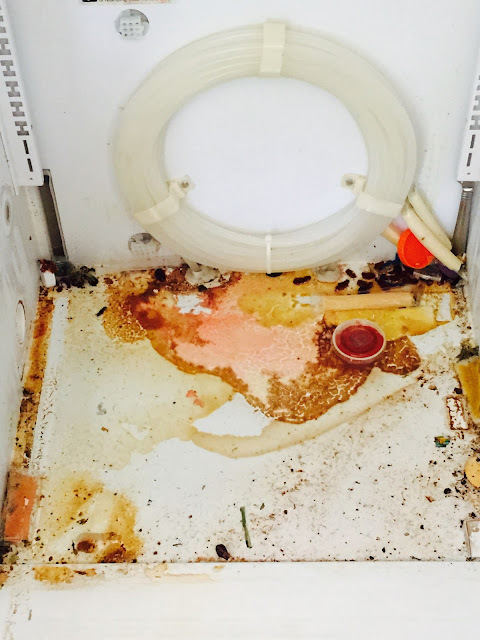 How many years worth of filth congealed on the bottom of the fridge? The repair man looked at me. He handed me a putty knife. Got on my hands and knees and started scraping. A mass of sticky unidentifiable crap with mold growing on top. An open container of ketchup. And even a knife with peanut butter on it for crying out loud. Foul and disgusting is an understatement. What’s grosser than gross, folks? Finally feels (and smells) like it’s mine? We are finally in our new house. We’re quite thrilled about this. is the endless unpacking and setting up. The entire interior of the house being repainted. 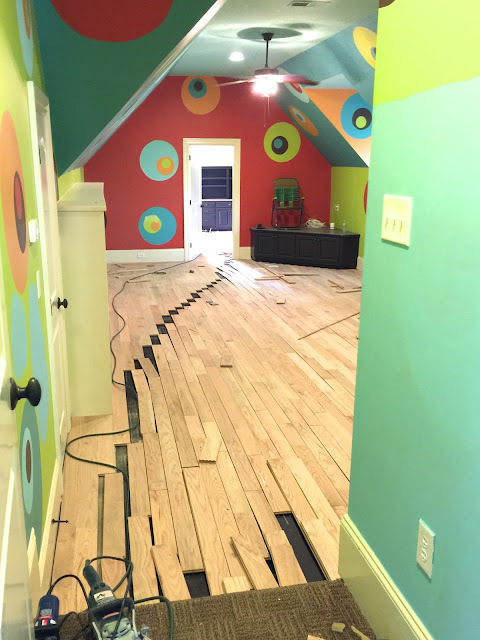 The painting crew fell behind schedule. They started our three week paint job the day our boxes and furniture were dumped into the house. First a rusted out hot water tank. Followed by a gas leak. Which resulted in our gas being shut off for a week & change. And cold showers all around. Almost cried when we got hot water back last night. Brand new washer failing the day after installation. There’s something up with the fridge too. something else will be broken. Is this what home ownership is about? Grateful to every person helping to make this big old house into our new home. But I’m also impatiently anticipating the day everyone packs it up and goes. The first day we can just live here. I’m meeting with all those guys everyday. While still unpacking box after box after endless box.